Your old incandescent has gone out and you decided to replace it with an LED bulb. You screw it in, turn it on, and… gahhh! While blinking away the spots in front of your eyes, you realize something: this LED bulb is too bright! But it was the same wattage equivalency as your old bulb, so why is it so much brighter? Notice the difference in delivered light. Designed to target the visible spectrum, the highest spike of LED light is in the middle. Since LEDs also generate a lower amount of heat, they do not lose as much light on the infrared end. What this means is that LEDs appear to be brighter compared to incandescent bulbs because they generate a higher amount of light that can be seen by the human eye. Kelvin (color of the light) can also alter the perceived brightness. Kelvin ranges from an orange color, around 2200 Kelvin, up to a blue color (i.e. 6500 Kelvin, which simulates daylight). A standard incandescent is usually around 2700 Kelvin, emitting the warm light you are used to. An LED of the same color temperature and Lumens will have a similar glow but will still be brighter. If you replace that 2700K incandescent with a 4000K, you are going to go from a yellowish light to a bright white. Large jumps like that are noticeable and can seem very drastic. While the light may seem very bright at first, you will adjust. If the light really bothers you, there are several ways that you can go about decreasing the brightness. If your bulbs are dimmable, then you can pair them with a compatible dimmer switch. We carry several types of wall dimmer switches and plug-in dimmers for table lamps. Lamp shades are also a useful tool for cutting light brightness by redirecting the light out into the room. If your ceiling lights are too bright, swap out clear covers and globes for frosted covers to soften the light. The frosted lens will help diffuse the light to more bearable levels, reduce glare on shiny surfaces like countertops and tables, and also look nice. 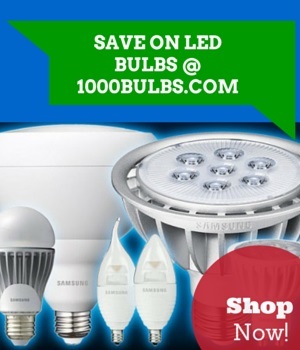 There is also the option of purchasing bulbs that have frosted glass. This is especially helpful for decorative lighting like chandeliers and sconces where the bulbs are exposed. Do you have question about choosing the right light for your room? Call 1-800-624-4488 to speak with one of our lighting experts. You can also leave us a comment below. Find more lighting tips by visiting our Facebook, Twitter, Google Plus, LinkedIn, or Pinterest page.